The on-again, off-again concept of bringing a permanent floating swimming pool to Pier C Park appears to be off again, as the charity foundation that was donating the pool has reached an agreement with Greenpoint, Brooklyn instead. The announcement came as a surprise because only three weeks ago, Mayor David Roberts announced plans to re-add a municipal swimming pool in a hollowed-out barge to the proposed Pier C Park at Sinatra Drive and Fourth Street. "At the present time, we do not have a swimming pool," city director of Community Development Fred Bado informed the City Council Wednesday night. The idea of the floating pool has been talked about for the past four years. 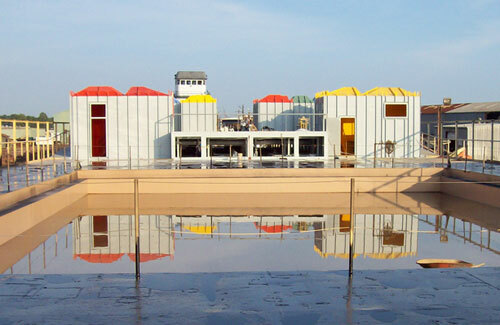 In December of 2000, former Mayor Anthony Russo held a press conference to announce that an Olympic-sized municipal swimming pool, to be donated by the Neptune Foundation of New York, would be the "crown jewel" of the new plans for Pier C Park. The pool value was worth approximately $2 million. When the Roberts administration came into office, the plans for the pool were put on hold. According to city officials, there were concerns that the pool would be too large for Pier C, and that getting Department of Environmental Protection permits could be challenging. Also, the cost of maintenance became and issue. According to city officials, yearly maintenance would run around $300,000. This year, the entire budget for all of the city parks is only $500,000. During a pubic meeting last March, planners presented the preliminary plans without the pool included. But then, just a couple of weeks ago, the Roberts administration announced that the pool had been re-added, and posted pictures of it on the city's web site. The announcement that Greenpoint has reached an agreement for the pool has sent local politicians into spin mode. The critics of the administration are on the attack, saying that the Roberts administration has dragged its feet and let a nearly $2 million donation float away. The administration, on the other hand, said that Pier C is still nearly two years away from being finished and that having a pool at the park is still not out of the question. "Our pool has floated to Brooklyn," complained administration critic Councilman Tony Soares at Wednesday's council meeting. The councilman asked Bado when he'd found out that the Neptune Foundation had reached an agreement with Greenpoint. "I found out a couple of weeks ago," said Bado. Soares then asked when the last time was that he has been in contact with the Neptune Foundation. "About nine months ago," said Bado. Soares responded that the administration had not followed up and had cost the city this pool. "If they don't hear from us, of course they are going to give the pool to someone else," said Soares. Bado added that he was not the point person for this project. He said that Cassandra Wilday, the city's current open space planner and the former director of environmental services, was the contact person for the Pier C pool project. Wilday said Thursday that she has submitted multiple memos to the mayor and other city employees that informed them of what the Neptune Foundation needed. According to Wilday, she told the mayor that it would cost $300,000 per year to maintain the pool. Before an agreement with the Neptune Foundation could be reached, she said, the city had to formalize that the pool would be maintained in the future. She added that she does not have to authority to make such a commitment and that only the mayor via the City Council could make such a large monetary commitment. Wilday said that the Roberts administration really shouldn't be blamed for Greenpoint agreeing to take the pool. "We're still two years away from finishing Pier C," she said. She added that the since the 1980s, the Neptune Foundation has been looking for a location for the pool, and when Greenpoint said they were ready, the foundation "jumped at the opportunity." She also said that while this is the only floating pool that exists now, it doesn't mean that this is the last. She said that the Neptune Foundation had always intended to place several pools in the New York metropolitan area and that another one could be available in two years, when the park is complete and Hoboken is actually ready to take advantage of the pool. Councilman Michael Russo, whose father originally was going to bring the pool to Hoboken, said that while there has been some degree of internal finger pointing, in the end, the blame should fall on Roberts' shoulders. "This has happened over and over again," said Russo. "We get excited about a new project, but are too often disappointed by the lack of follow-through." Roberts said Thursday that it is "regrettable" that the Neptune Foundation will be donating the pool to Greenpoint, but said that $300,000 per year maintenance expense might have been too high a price. Roberts said that the city will continue to investigate the possibility of a floating pool for Pier C, but will also look into other options. He said in the short-term, above-ground swimming pools for this summer "might be a temporary option." According to Environmental Services Director Joseph Peluso, Peluso has been in contact with companies from whom the city could purchase a 30-by-30 foot pool for around $15,000. One or more pools could be installed at different locations throughout the city, he said. Roberts added that he would get the City Council's approval before appropriating any money toward a temporary pool. "I think this might work out very well in the short term," said Roberts. "Then we can work with our planners and look for a permanent location for a swimming pool that can open in 2005 or 2006."